In Greek mythology the Ti-tânes or Titans, were the ancient primordial deities born from Gaia or Gaiê (Earth) and Ouranos (sky). The Titans in a sense were products of primordial nature and eventually overthrown by the Olympians (the more human-like gods represented in classical Greco-Roman mythology). 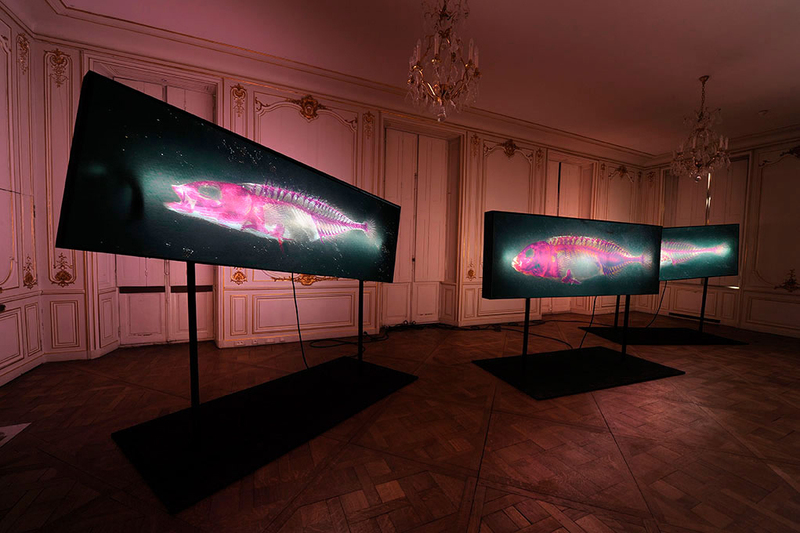 This paradigm shift is a strong metaphor for our Western approach towards nature and the environment, a change from revering the natural world to anthropomorphic adoration which continues to drive human-centric exploitation of natural resources and other organisms. Although the Ti-tânes were defeated by the new human-like gods, they survived banished to austere lands. 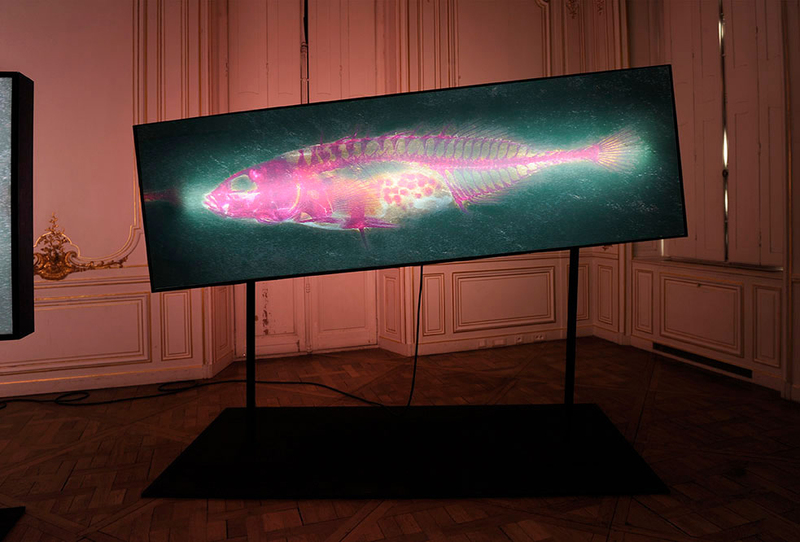 As artworks this series began in 2012, where I selected a species that firstly is ancient (in the evolutionary sense) and secondly is able to survive (perhaps even thrive) in habitats environmentally impacted by human activity. Such organisms literally have endured for millions of years and now are adapting to today’s ecological degradation. 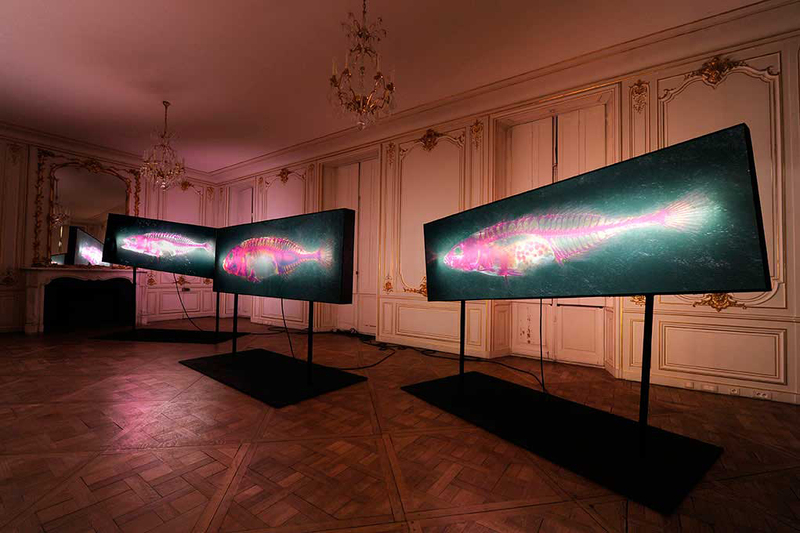 For the works in this exhibition, three Nine-spined stickleback (Pungitius pungitius) collected from the a polluted canal in Chamarande (France) were chosen as subjects and carefully stained using Alizarin red dye, which adhered to bone then cleared using digestive enzymes to make surrounding tissues transparent. From the biological research side this was done to analyze specimens for any developmental abnormalities that in life we could not have seen. 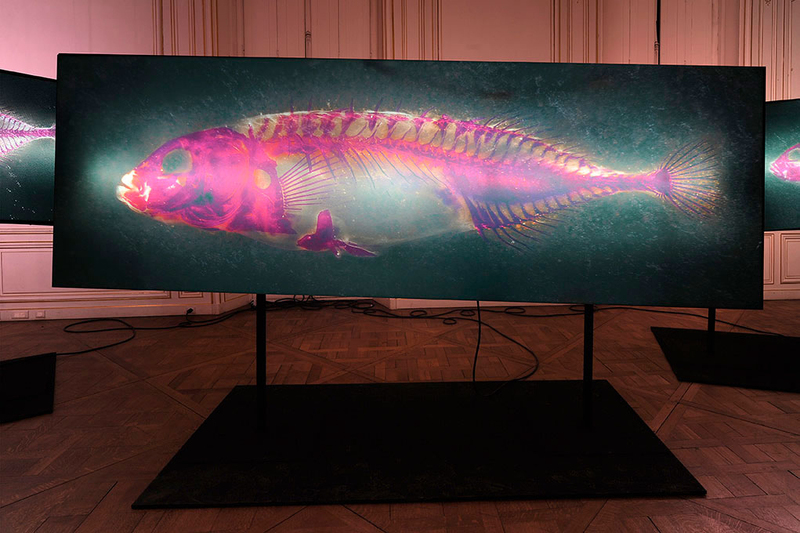 Secondly, this treatment was performed as an artistic choice- as clearing and staining is a way to change the way we are able look at such organisms, how we perceive them- they are abstracted yet made more clear. Next they were photographed on coal (literally fossilized carbon) meant to recall ancient life as well as changes to today’s climate made through the continued burning of such fossil fuels. 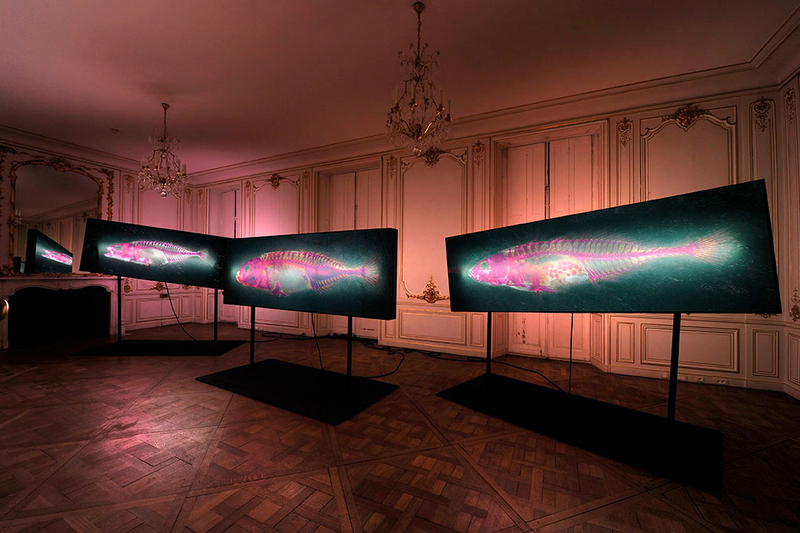 These artworks are meant as portraits of the individual fish, as each is unique as each of us. Through size (making them larger than life) they are scaled so the human viewer sees them at a magnitude beyond our ordinary bodily scale- grandiose and sublime like nature herself. Metaphorically they are meant to recall the ancient lingering nature deities surviving in banished now degraded environs. 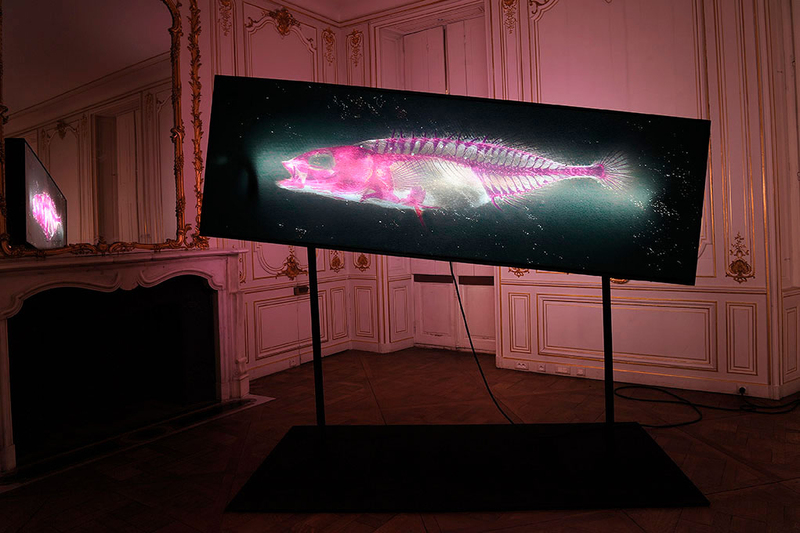 Viewed as skeletons they are not meant to represent death but instead life persisting in ecosystems made preternatural by human activity.